Blu-ray players play standard Blu-ray discs, which feature content in High Definition (also known as HD or 1080p). If you’re looking for a Blu-ray player that supports Ultra High Definition (4K) Blu-rays, you’ll need to buy a 4K Blu-ray player, which will be more expensive. Standard Blu-ray players work with both HDTVs and 4K TVs. While it's true that the world has fallen in love with streaming movies and TV shows, movies on disc still have their place. In fact, movies on Blu-ray still offer the best audio and video quality, bar none. Blu-ray movies can turn any home theater into a cinema, and you never have to worry about your content disappearing from a streaming service. Whether you're an AV geek, a collector, or you just love movies, a Blu-ray player is one of the best ways to scratch the itch. Here's everything you need to know about picking one out. All Blu-ray players are capable of basic playback of Blu-ray movies, but when it comes to convenient features, manufacturers don't stop there. Here are the most useful secondary features we've seen on modern Blu-ray players. One of the best things about modern Blu-ray players has nothing to do with Blu-rays at all: many models now include on-board WiFi and streaming apps, so you can stream movies from all of the major services from the comfort of your Blu-ray player. With the right Blu-ray player, you can save yourself the expense of buying a separate streaming box (and avoid having to keep multiple remotes around as well). Upscaling is the technology used when a lower-resolution image is digitally enhanced and presented on a higher-resolution screen. Most TVs have built-in upscaling, so if you're connecting a DVD player to an HDTV, the TV will upscale the picture to use all of the available pixels. However, most TV upscalers aren't amazing, and you'll get a better picture by disabling the TV's upscaling and using one from your Blu-ray player. As you compare Blu-ray players, pay attention to user reviews of upscaling, and make sure your legacy content would look as good as it can. Many Blu-rays include premium audio formats for home theaters equipped with surround-sound, such as DTS HD-MA, Dolby TrueHD, and even Dolby Atmos. If you've got a multi-speaker setup -- or you plan on building one in the future -- you'll need a Blu-ray player that can play all of the high-resolution formats. Read product pages closely to see which formats each Blu-ray player supports. Blu-ray players that cost less than $90 are often very basic, and many skimp on critical features or deliver sub-par picture quality. Players with built-in streaming apps aren't that much more expensive, so it may be worth spending a little more for access to the additional content. Blu-ray players that cost between $90 and $150 often provide the best value. Players in this range deliver solid video quality and typically have a generous offering of additional features, such as streaming apps or support for Bluetooth connectivity. There are a lot of Blu-ray players that cost over $150, but most of them don't bring enough unique features to justify the expense. Products from stellar makers like Yamaha and Oppo are notable exceptions, as they both offer options that can be appreciated in a proper home theater. Q. Can I play DVD movies on a Blu-ray player? A. Yes. Blu-ray players are backward-compatible with most mainstream disc formats, like DVDs and VCDs. In most cases, the Blu-ray player will upscale the DVD's picture from DVD quality (720x480, or 480p) to HD (1920x1080, or 1080p), improving the sharpness and detail of the movie. Q. Will a Blu-ray player work with my soundbar? A. Yes, as long as they have compatible connectivity. The most common ways to connect a Blu-ray player to a soundbar are by using an optical cable or an HDMI cable. If you use an optical cable, you'll need to connect the Blu-ray player to the TV using a separate HDMI cable. If you plan to use an HDMI cable to connect to your soundbar, you'll need a second HDMI cable to send the video signal from the soundbar to the TV. Q. Can I rent streaming movies from a Blu-ray player? A. Yes, if the Blu-ray player includes video streaming apps. Many Blu-ray players include apps that allow them to also function as streaming boxes, and it's common for these apps to include a digital rental service like Vudu. If you plan to rent a lot of movies to stream, make sure the Blu-ray player you buy supports you preferred vendors. 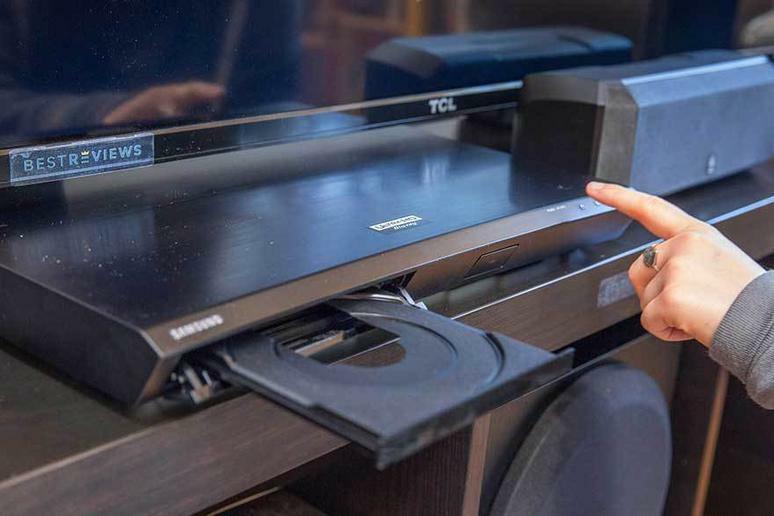 Our take: Yamaha's Blu-ray players are some of the most technically proficient on the market, and the AVENTAGE delivers some premium features that the competition can't touch. What we like: It's got fantastic upscaling to 4K, and it supports premium formats like DSD and SACDs. What we dislike: Although it can stream videos from your local network, it doesn't support streaming video apps like Netflix or Amazon Video. It's also on the expensive side. Our take: It you just want the basics, this lower-priced Blu-ray player from a reputable brand may hit the spot. Potential buyers should read the specs first to make sure this is what they want, however. What we like: Works with some smartphones. WiFi is built in, and 3D is supported. What we dislike: The built-in WiFi is built on an older standard, so it can feel sluggish at times. Our take: Sony's Blu-ray player is good at everything -- it's a great Blu-ray player, a high-quality streaming video box, and it can even stream video games from a PlayStation 4 on the same network. What we like: It's got more than 300 apps, and it's incredibly affordable. Game streaming means you can play PlayStation titles, even if your PlayStation is in another room. What we dislike: It doesn't support premium audio formats like Dolby Atmos.